Christmas cheers, New Year greetings, a beautiful slight chill in the crisp Mumbai air and we sit back with fond memories of the national seminar. Grinning at our successes and a little contemplative about where and how we can improve on our work in future. In Vinita's words from Bangalore..
"If we were to choose one event in 2011 that made the year that much more meaningful, it would probably be the National Seminar on Urban Farming hosted by Urban Leaves, Mumbai (held on 10-12 Dec 2011)." Yes so do all of us at Urban Leaves feel. After six months of planning and detailing, co-ordination, the seminar began with lighting of the lamp by the marshals of city farming in India. need to spread awareness and knowledge to more cities in India. Priti Turakhia and Sudha Dehadrai invoked the blessings of the Divine through Kabir Dohas and Shanti Mantra respectively. An auspicious beginning for such an important event. First session by Clea Chandmal's on permaculture seemed like the perfect start to the seminar. She put forth the practical, scientific and spiritual aspects of permaculture in a simple and easy-to-understand manner. The session opened up different ways of seeing, observing and understanding life around us – the soil, the plants and the other creatures inhabiting the environment. The session on Herbs and their medicinal properties by Kusum tai Dahivelkar saw several participants take copious notes while Kusum tai named plant species, their characteristics and relevant recipes so effortlessly. 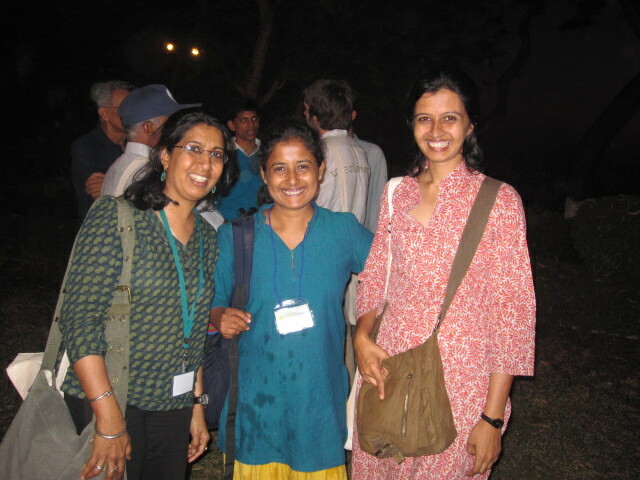 Sreedevi's talk on GMO was a good wake-up call for all of us. Dr Pandit's session to highlight the key principles of Natueco farming was a useful precursor to the hands-on Amrit Mitti making workshop on Day 3. A central theme of the seminar was eating natural, healthy food and the fact that this was possible without resorting to excess oil, salt or spices was clearly evident from the delicious fare served for all the meals on all 3 days by the Health Awareness Centre. 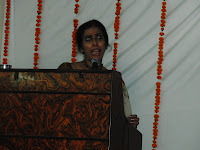 Anju Venkat's session basically trashed all that we had so far considered as healthy food! And though everyone didnt promise to change all their food habits overnight, it certainly got them thinking more about foods in their natural state. It was now time to visit the community farms at Maharashtra Nature Park and Nana Nani Park. The visit to Nana-Nani park at Chowpatty and interactions with Purvita, Ubai and the team managing the effort, showcased the possibility of using a community space to garner public in the initiative.Urban Leaves team with Clea had planned a garden designing activity for all the participants. This turned out to be a very interactive and enjoyable exercise for everyone! The garden designing exercise on applying their learnings from the permaculture session saw all of participants transform into eager students, each trying to remind the other about one principle or the other that Clea had shared with us the previous day! 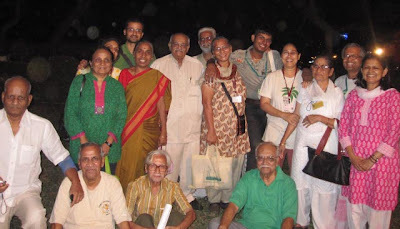 In Vinita's words again: "The session on Amrit Mitti on day 3 was the icing on the cake for many of us. Preeti, in her trademark patient, matter-of-fact and jargon free manner explained the why and how of Amrut Mitt.This was followed by a hands-on session that all participants thoroughly enjoyed. Those who stayed back and visited the Bombay Port Trust urban farm saw the power of Amrut Mitti. Look at those smiles and fun! A bus ride to the Mumbai Port Trust Terrace garden got everyone excited like young children! took care of all our last minute glitches,was the perfect host and project co-ordinator. The seminar was a great learning experience for me – not just in terms of technical know-how, facts and information but more significantly, in seeing and understanding the power of working as a community in harmony with nature. I think this was articulated beautifully when Julius Rego shared his experiences with us on day 3 and quoted Masanobu Fukuoka, “Natural farming is not just for growing crops, it is for the cultivation of better human beings”. 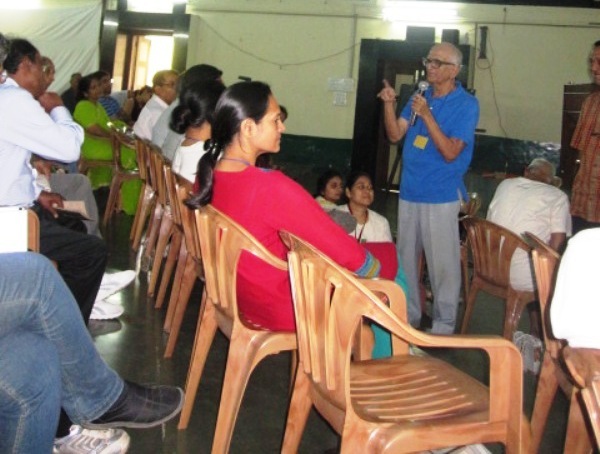 "I think apart from the planned sessions, what also made the seminar so much more alive and useful was the sharing of experiences from people across the country. The sincerity with which Mr Khillar from Orissa shared his experience of terrace farming was touching. Sangeetha Sriram from Chennai shared their journey of establishing reStore not just as a store for organic produce but also as a hub for exploring alternative livelihoods. Meeting people from all walks of life and from across the country and hearing of their efforts and passion reaffirmed one's belief in this process of working with nature. I believe its not just memories of a good time that each of us has carried away but also a part of the energy that comes from learning together; and this I think will stay with us for a long time to come. Now eagerly looking forward to the next seminar – with more learning, more urban spaces transformed into food forests and better human beings." For those who were not able to attend we share a copy of the booklet containing a gist of the lectures presented.Click on Link below to read. I know we are a little late, But Better late than never... We request all of you to share your experience and feedback of the seminar. Dont forget to leave us a comment on the blog itself!